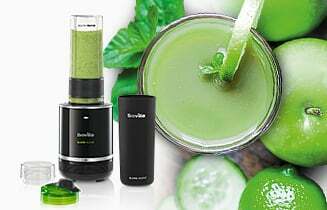 The Breville Blend Active Personal Blender in green perfectly complements a healthy and active lifestyle. Simplifying the process of creating delicious and nutritious smoothies, shakes and juices; the Blend Active utilises innovative technology to give you greater freedom in the kitchen. A blender and stylish sports bottle in one, the Blend Active Personal Blender can help you power up for the gym or the office in seconds. Simply fill the one-person bottle with the ingredients for your favourite smoothie or juice, affix to the motorised based, blitz for a few seconds and then unscrew. A quick and delicious snack or treat in three easy steps. Regain control of your pre and post workout nutrition – carefully selecting the finest ingredients recognised for their health and energy benefits. Often more cost-effective, healthy and delicious than store-bought smoothies and energy drinks, homemade alternatives could revolutionise your exercise routines – giving you more energy and keeping you alert. The bottles of the Blend Active range are designed for people on-the-go. The non-drip cap and easy-grip bottle make it perfect for long jogs and exertive gym classes. What’s more, the clever design and positioning of the blade quickly blends through fruit, veg, nuts and ice – distributing the results evenly, so no build-ups of powder and gunk in the bottom of the mixture. At 600ml, the Blend Active bottles are sizeable enough to contain an energising and invigorating smoothie – helping you go that extra mile or complete that personal milestone. If you decide to stock up on spare bottles or extras for the rest of the family, the Breville store stocks Blend Active bottles, designed to fit perfectly with the Personal blender. 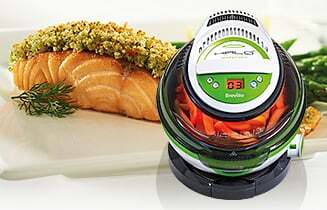 Breville Blend Active Personal Blender with x1 600ml Bottle, Green is rated 4.7 out of 5 by 1904. Rated 5 out of 5 by kati88 from For the price you can't go wrong Got this to make smoothies on a morning. It's strong enough for ice but not so much for seeds in fruit, but this is really good quality for the price. You can come across additional bottles for quite cheap too. I fill the bottle with frozen fruit and put in the fridge before bed, then add juice, ice and frozen yoghurt in the morning before blending which takes at the most a minute. Not had any issues with leaks and the bottle cap has a handy lock if you push it right back when opened, which stops it falling back on your nose when you take a swig. Also really easy to clean and small enough to store away in a cupboard. Overall I'm really pleased with it. Rated 5 out of 5 by Anonymous from Amazing blender! I bought this a couple of weeks ago and I absolutely love it! It's so quick and effective and it blends into the cup you drink it from - what more could you want?! Amazing price too, definately the best value blender I've seen around. 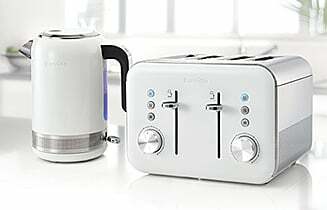 It's perfect if you have a small kitchen and don't want a huge contraption, this just sits in the corner taking up minimal space. This is the first blender I've seen with such little washing up required too, only the blade and the cup itself (both dishwasher prof too!). I can't recommend this enough, and Tesco's next day store delivery made it an even better buying experience! 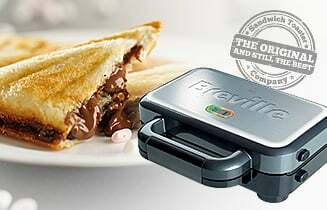 Rated 5 out of 5 by Shil92 from Great product - fast and easy! I bought this product not so long ago and very pleased I did. It is the perfect size and sits easily in my kitchen with suckers at the bottom so it doesn't move about, the bottle size is perfect, enough to fill you up and enough to put stuff in. It's just so simple to use, literally done in seconds. Can freeze the bottle too so can prepare the night before. I love the fact you can simply just juice, change caps abd leave the house. Light weight bottle, size that fits into bag easily and easy to clean too!! Rated 4 out of 5 by KarenD from Great addition to my kitchen I'd been looking for a simple, reasonably priced blender to make smoothies and protein shakes and came upon this one from Breville. It's perfect for my needs. I use it every day to make my protein shakes for the gym. I also make quick and easy smoothies using frozen fruit, milk and ice. It copes with the frozen items very well and demolishes the ice cubes! It's easy to keep clean and is small enough to stay on the work top instead of hiding in a cupboard. V pleased! Rated 4 out of 5 by Blueangell from Good alternative to NutriBullet I bought this blender because while I was interested in the Nutribullet shake craze, I was not ready to part with all that money to pay for one, especially as I often use things like this once or twice and the fad is over. I paid £20 for this blender and have used it plenty of times to make shakes and smoothies, and I have had no problems. I do not regret passing over the more expensive alternatives, but then I do not use it every day. It is easy to use and clean. The only thing I am unsure of is the ability to deal with 'tougher' ingredients like cores/skin/stalks, etc. as I have never tried. Bought this blender about four months ago - try it!